The winner of our Best Picture of the Month Competition for August was Amy Irvine, who’s dad Mat Irvine, (pictured here in our ROBOTs T-shirt) was a Technical Consultant and Visual Effects Designer who worked on television, primarily for the BBC. 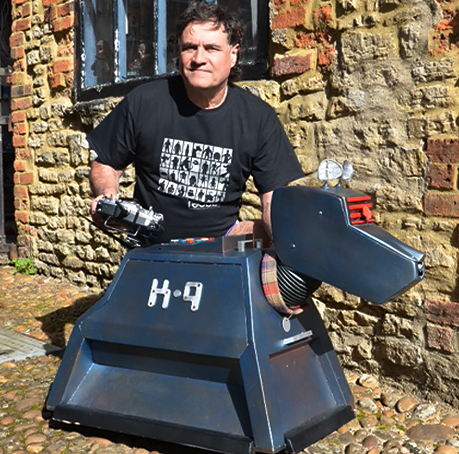 He’s probably best know for his work on Dr Who and was involved in building K-9 and has operated and looked after him over the years, and still does. A big thanks once again for all the entries this time round. So, do you want to have a go at entering our Best Picture of the Month competition for September and for the chance to win 3 Last Exit T-shirts? Send your entries to: info@lastexittonowhere.com – or us our Facebook or Twitter pages to show us your work. All entries must include a Last Exit to Nowhere reference.